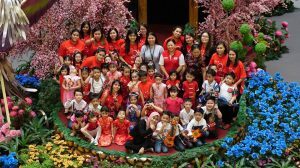 To celebrate the 15-day long of Chinese New Year celebration, Smart Reader Kids® preschool group successfully conducted six Chinese cultural-related activities for about 300 students at six locations in Sarawak and Sabah recently. 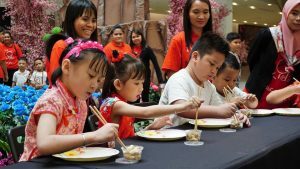 The locations that held these activities were Vivacity Megamall and Emart Batu Kawa (Kuching), Star Mega Mall (Sibu), tHe Spring (Bintulu), Centre Point Sabah (Kota Kinabalu) and Kompleks Ujana Kewangan (Labuan). Amongst the activities held were Lantern Word Guessing session, Picking Up Peanuts With Chopsticks competition, Eating Mandarin Orange competition, Group Chinese Cultural performance, Game Board activities, Parents and Students’ Chinese New Year Fashion Parade and Chinese New Year Singing session by Smart Reader Kids® students. 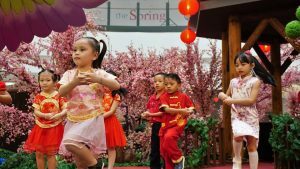 According to Norma John, Manager of Business Development and Operations (East Malaysia) of AIM Smart Academics Sdn Bhd, a subsidiary of Smart Reader Worldwide, organising Chinese New Year events is a yearly agenda for Smart Reader Kids® East Malaysia Centres. “Chinese cultural-related activities is important because it acts as a strong platform to instill the understanding and appreciation of one’s culture and tradition amongst young children,” she said. Besides, these activities gave students the opportunity to interact between themselves and boost their self-confidence when performing in public. Lantern Word Guessing session also encouraged young children to improve their vocabulary knowledge through a creative, simple and fun way. Also present was Steffi Edwin, Advertising & Promotions Executive at tHe Spring Shopping Mall Bintulu. Smart Reader Kids® is a franchised preschool programme offered by Smart Reader Worldwide Sdn Bhd. The programme are Smart Reader Kids®, Smart Reader Kids Islamic™, Smart Reader Kids® Mandarin Medium, Smart Reader Kids® Intensive English Programme, and Smart Reader Kids++® franchises.